This place gets double love because not only is it a great lunch or dinner spot when strolling through the streets of Mitte, it’s also inside a very special building, the old Jewish Girl’s School. Mogg and Melzer have established themselves as the Pastrami Deli in Berlin. 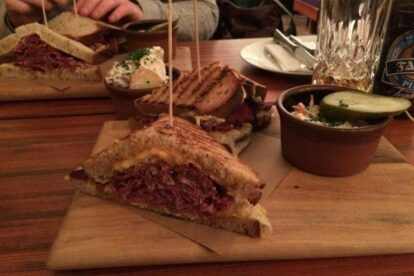 Indulge in a Pastrami sandwich or a luscious Reuben with a side of pickles -as it should be-accompanied by wine or a nice, cold Bayreuther Helles. For those loving vegetarians out there; a beautiful lentil, avocado and chipotle sandwich. Add a side or a fresh salad. The menu is not large but it offers all the delicious highlights of a New York Jewish Deli. And it’s cozy in there. Especially during the winter months. The building, designed by Alfred Beers in 1927, receives you with a beautiful foyer lined with red and green tiles and concrete floors. It has open staircases and silver plated columns that have survived decades. The details in there take you back in time. What was once a school, deportation center, and hospital and center for Hitler youth has now gone back to the Jewish community and houses great eateries and galleries.